Since deciding to take a more conscientious approach to feeding Muttley we’ve been testing out a whole heap of new dog food brands and seeing what we like and what agrees with him. As you’ll know, it’s not all about the ethics, the packaging or even the fact as to whether it’s UK based – it’s whether your dog eats it that is the main thing! Mind you, if he eats something that ticks all your other boxes that’s great – and we’ve found something that does that for us – Lily’s Kitchen. Here’s our Lily’s Kitchen dog food review – spoiler alert, we love almost all that they produce! As I said, we’re trying to be a bit more conscientious in lots of areas and one is by choosing good food for our dog Muttley, local if possible and from somewhere that truly cares what goes in to his food and not just what profits they can make. Some dog food is so utterly dire and although I have fed it in the past to my old dog, I was young, didn’t have much money and didn’t have the knowledge that we have nowadays about food quality. I really didn’t think twice about it then, and I suppose some people still don’t, but I am glad that we’re waking up a little and caring more about what we feed our dogs. So, on to Lily’s Kitchen. Now, I love this company. I love all they stand for, their ethics and their love of dogs (and cats). They truly believe that our pets deserve proper food and strive to supply that. The food is made with natural ingredients and you can actually read the ingredients list and feel like you understand it and that it will be enjoyable! I love their commitment to the environment too – they have organic food options and their packaging is eco friendly and recyclable. As I said before, you can have all the best ethics and ideas in the world but if your dog won’t eat it then there’s no point really. We’ve been trying out both the dry dog food and the wet dog food as Muttley likes to have a bit of variety in his life. There is quite a lot of choice in the range and with the exception of a couple they’ve all been huge hits. This was our first test with Lily’s Kitchen and it was a complete success – Muttley could not get enough! It’s key ingredients are chicken (31%), duck (8%) and sweet potato (30%) and the rest is made up of real foods and vegetables that provide a host of nutritional benefits and vitamins. Importantly, it’s also grain free which is really good for many dogs as grains can cause so much stomach upsets. The kibble is a really good size and as I said, was thoroughly enjoyed by my dog! The bags come in small 1kg bags, all the way up to 12kg size. You can see the different options here. There’s also plenty of variety in flavours in the dry dog food too – you can also get Lamb, Venison & Duck and Organic Chicken & Vegetable. For older dogs there’s Salmon & Trout and if you have a puppy then their Chicken & Salmon option is for them. Once a day Muttley gets a wet dog food option and it’s probably his favourite time of day! (His second favourite is his other food time) Again we’ve been testing the variety of foods that Lily’s Kitchen has to offer – there are a lot! I’ll say that the one flavour option that didn’t go down so well was the cottage pie one – not sure why, but he just didn’t enjoy it so well. His favourites seem to be Sunday Lunch and Fish supper – although I think there’s still a few options we haven’t tried yet! As well as a host of proper dog food, Lily’s Kitchen also does a good range of dog treats and biscuits. Again, we’ve not tried everything (Muttley would be needing some diet food if we had!) but we have given the bedtime biscuits a try which seem to be enjoyed. I like them as they have chamomile in them and some other calming ingredients so if you have a dog that needs settled on a night time it would be a good thing to try. If you’re a busy person who is rushing around in the morning then feeding the dog at the right time is just another thing to add to the endless to do list isn’t it? One way to get round that is to get an automatic feeder for your dog which will feed them at a certain time. It’s also good if you have an unreliable schedule and want to give your dog a regular feeding time. In this article I’m looking at the best automatic dog feeder with a timer so you can take that extra item off your to do list! You have a few different options when it comes to automatic pet feeders. You can get simple ones where the compartment with the dog food opens or is revealed at a set time or you can get some that dispense the food in to food bowls at a set time. Either way, they’re simply a dog bowl with a timer! The first kind needs more attention from you as you’ll need to make sure you’re on top of keeping it filled up – likely it won’t last longer than 2-3 days worth of food. The latter can hold sometimes up to 90 days worth of food so just needs topping up when it gets low. Price is a factor of course with the more simpler self feeders being cheaper than the dispensers. Another thing to consider is the size of your dog. Larger breeds may find that the small automatic feeders aren’t nice to eat out of or perhaps won’t even hold enough food. Often these feeders are designed for both dogs and cats so are a size that fit smaller animals. Most of these are designed to work indoors and are generally battery operated – if you want something for outside make sure that it is well covered from the elements and they should be good. Finally you need to think about what food you’re likely to be feeding. If you want to use wet food then a dispenser isn’t going to work at all and you’ll want something that just opens up at the right time. Personally I think these items lend themselves better to dry food. This digital pet feeder station from PetSafe is one of the top rated on Amazon and it’s really popular right now. It is the most expensive item on the list though, but I think the options you get with this and the fact it’s suitable for bigger dogs too makes it a great item. Another automatic pet feeder from PetSafe is this 5 meal feeder. It’s a more traditional idea of a feeder where you fill up the tray with the portions and it will rotate so that when you want it to it will reveal the food. I’d say this one is better suited for smaller dogs but perhaps if you have a larger dog who is fed more often during the day to prevent them gulping down too much it would be good too. This pet feeder from Andrew James is another of the style of a rotating tray which reveals the food at set times. One unique thing about this one is that you can record a message of up to 8 seconds long too. So if you want to be able to tell your dog it’s dinner time it can do that! It’s a good size feeder as well and can suit larger dogs so long as their portion sizes will fit in. voice recorder – leave a message for your dog! Perfect for… leaving your dog a message! This is a really smart looking automatic dog food dispenser which is welcome as some can really look pretty ugly. I think this one would look great in any home and not look out of place. Like the Andrew James feeder above this one can also record a message for you to play to your dog when their food is being dispensed. This timed dog feeder can only feed up to 4 times per day so if you need more times than that you’d need to look elsewhere. My favourite feature of this one is that if the tray ends up with more than 13 portions in it (each ‘portion’ is 10g and you can dispense up to 10 ‘portions’ in each feeding time), it will stop dispensing. So, for example if your dog isn’t eating it won’t keep sending more food in to the tray and potentially making a mess. Author SarahPosted on February 10, 2018 February 10, 2018 Categories Dog healthLeave a comment on What’s the best anti bark device for dogs? Dog rocks review – does it really work? I was really excited to give these dog rocks a go – I mean I’m all for natural ways of living along side our dogs and this is the main sell of this product. A natural way to prevent the pee patches appearing on your lawn – too good to be true? Dog Rocks are basically a special kind of rock that the makers have imported all the way from Australia. The rocks help draw out the impurities in your dogs urine that are the causes of the patches. It draws out tin, ammonia and nitrates, among other things – it’s actually too much nitrogen which burns the grass and kills it. It’s really easy to use Dog Rocks – you simply place them in your dogs drinking bowl and add the water to the bowl. What it does is draw out and filters the impurities in the water that also causes the urine to kill off the grass. In fact, they say that without the impurities that it actually helps fertilise the lawn! What it doesn’t do is alter the PH of the water or of your dog’s urine and it’s completely safe for dogs to drink the water the rocks have been in. The dog rocks last for around 8 weeks and then they need replaced so they are an ongoing cost which needs to be born in mind, however if you want to get rid of those unsightly patches on your lawn you might agree that it’s worth it. Do Dog Rocks actually work? Well, this is the big question! I have to say that the internet world is mixed on whether they do work or not – they are certainly a bit marmite with people and I have done a lot of research on these. Dog owners either feel like they have found a miracle product or that they are the biggest waste of time going. Your mileage may vary is definitely a phrase that comes to mind. What we found is that it took a little while for our lawn to recover from the dog burn patches – of course, the grass was dead! We didn’t find any new patches but I think it might take a while for our lawn to look amazing again. I do think they have made a difference though and we’re really happy to have a much nicer garden to sit out in now. I wish I’d taken photos at the beginning so I could compare! For the price I definitely think they are worth a go – it’s cheaper than the cure to your lawn! I’d suggest not expecting to wake up to a lush green lawn the day after using them, obviously that isn’t going to happen, but be patient and see how it goes. Author SarahPosted on September 10, 2017 November 10, 2017 Categories Outdoor Dog GearLeave a comment on Dog rocks review – does it really work? Your dog can’t tell you when they are having problems with their teeth so it’s up to you to keep an eye on them and make sure that looking after them is a top priority. Tooth problems in dogs can be indicative of some underlying issues so if there are any concerns at all then do contact your vet and have a word with them about. get your dog used to you being around their mouth so that you can make it a regular check. If your dog hates it then start small and reward your dog for letting you near them. Eventually, with some time and patience you should be able to see more inside. Make it a regular check up – every week is good. If you have a grooming schedule then stick to that and just add in a mouth check up. Dog chews that are specifically for teeth are a good addition for your dogs health – they are especially good if your dog is nervous when you’re around his mouth. These are a good option. Choose dog toys that are good for your dog’s teeth – there are many different options of chewing toys available, some with nodules that help get rid of plaque. Rope toys can be good and encourage chewing. Dry food is good to be added to your dogs diet as the rough nature of the food helps to clean the teeth. Finally – if your dog will allow it, a good dog toothpaste is a good addition to your grooming routine. There are many different kinds on the market right now and in addition to a good toothbrush it will help to reduce the build up of plaque and in turn reduce tooth decay in your dog. Less bad breath is a nice side effect! Dogs are amazing at giving hugs, sloppy kisses and just generally bringing joy to every day. Sometimes they want to let their owners know how much they love them by buying a gift for them on special occasions, like Christmas, birthdays and Mothers/Fathers day. 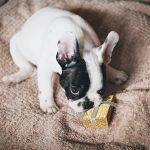 Now, they do need some human help in getting their perfect gifts so if a dog you know has enlisted your support in this quest I hope this guide to our favourite gifts from dog to owner is helpful! A dog normally likes to give gifts which reinforces the bond between himself and his owner – this normally comes in the form of humorous items which show how much the owner REALLY loves dogs and in particular the gift giver! Just for fun and to have along side the cup of tea when you’ve finished your big walk, a book about their favourite thing – dogs of course – is just the ticket! See more about this book on Amazon here – there’s quite a few in this series! Of course the ideas are endless – here’s a few other items that I came across and liked and would be a perfect gift from dog to dad or mum. A scrapbook to remember all the fun times you have together! See more about this here. A bag to use when carrying all those yummy dog treats and food! And lastly, a little bit of class with some sterling silver earrings. Perfect for reminding owners of their wonderful pets every time they look in the mirror!